The BEST Watermelon Recipe for Summer! Watermelon is just what a body needs to stay hydrated and cool in our nonstop summer heat. Lucky for us, watermelon season in Central Texas is just about to start, and lasts until October or November, right around the time the first cool front arrives. In fact, we just got word that Johnson’s Backyard Garden will have watermelons at the SFC Farmers’ Markets starting this weekend! If you’re cooking for a big crowd or need something to take to a cookout, this is the perfect recipe to spice up your watermelon slices. Additionally, you can use the spice mixture to rub onto fish, vegetables, or chicken before they hit the grill. Refreshments: SoCo Ginger Beer has so many awesome flavors this weekend including blackberry, hibiscus, pomegranate, jalapeño lime, blueberry, and white peach. Come try them all! Fresh Cuts of Meat: Stop by Peach Creek Farm for a variety of beautiful cuts of meats including beef, pork, sausage, and even dog food. 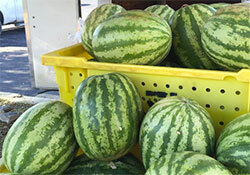 Summer Melons: This week Johnson’s Backyard Garden is expecting melons! 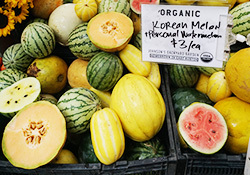 Visit them and find Crenshaw melons, Galia melons, Korean melons, and watermelons. 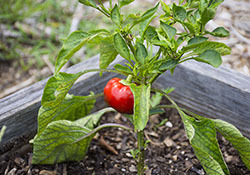 They will also have of plenty of tomatoes, basil, green beans, pickling and slicing cucumbers, eggplant, garlic, greens, and much more. Check them out Downtown, at Sunset Valley, and the Triangle. Fresh Dairy Products: Richardson Farms will have fresh whole milk (with cream on top!) sold by the gallon, half gallon, or quart. They will also have delicious cream for sale, perfect for pairing with berries, hot drinks, or with chocolates from Cocoa Puro Chocolates. 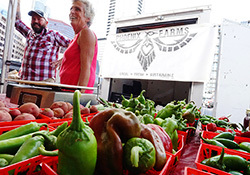 Available at both Sunset Valley and Downtown markets. Cool Off: Gelato is perfect on a hot summer day. Visit Austin Gelato Company to try their amazing flavors of gelato - Very Vanilla Bean, Coffee & Cream, Double Dutch Chocolate, and Nutty Pistachio. Perfect for Cookouts: Blue Earth Farm will have their chemical free, pasture raised chicken (whole & half cuts) and pasture raised pork.